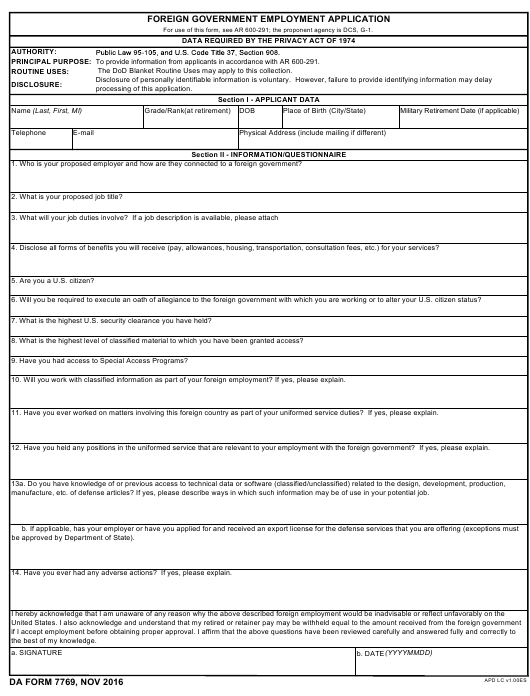 DA Form 7769 - also known as the "Foreign Government Employment Application" - is a United States Military form issued by the Department of the Army. The form - often mistakenly referred to as the DD form 7769 - was last revised on November 1, 2016. Download an up-to-date fillable PDF version of the DA 7769 down below or look it up on the Army Publishing Directorate website. For use of this form, see AR 600-291; the proponent agency is DCS, G-1. To provide information from applicants in accordance with AR 600-291. 1. Who is your proposed employer and how are they connected to a foreign government? 2. What is your proposed job title? 4. Disclose all forms of benefits you will receive (pay, allowances, housing, transportation, consultation fees, etc.) for your services? 5. Are you a U.S. citizen? 6. Will you be required to execute an oath of allegiance to the foreign government with which you are working or to alter your U.S. citizen status? 7. What is the highest U.S. security clearance you have held? 8. What is the highest level of classified material to which you have been granted access? 9. Have you had access to Special Access Programs? 10. Will you work with classified information as part of your foreign employment? If yes, please explain. 11. Have you ever worked on matters involving this foreign country as part of your uniformed service duties? If yes, please explain. 12. Have you held any positions in the uniformed service that are relevant to your employment with the foreign government? If yes, please explain. manufacture, etc. of defense articles? If yes, please describe ways in which such information may be of use in your potential job. be approved by Department of State). 14. Have you ever had any adverse actions? If yes, please explain.